Dear Micromanagers, you can’t micromanage God! Walking down the street this morning, I was cold. With scarf wrapped around my neck and coat zipped as high as it would go, I walked to my destination, which was just at the end of the block. I almost missed it. It was purple in color…kind of hard to miss, and yet in my rush to get on with my busy schedule, I nearly missed a message seemingly intended for me. Cars roared by, billowing out smoke and steam into the frosty air. School buses, full of students bemoaning the early mornings with backpacks full of homework yet uneaten by the dog, passed me by on their way to buildings of education near by. It wasn’t far now, my destination, just mere feet…then I paused. There before me, printed on a stark concrete slab were words that I needed to see. 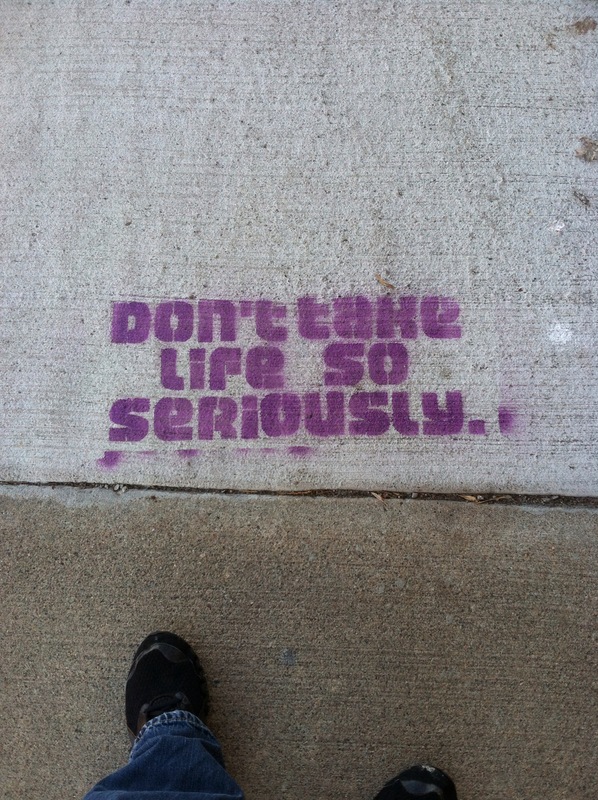 In purple were the words, “Don’t take life so seriously”. In my whirl-wind day, as weeks would soon be upon me that would pull me in every which way, I needed those words. They spoke to me. They didn’t say to me “just ignore the priorities of life”, or “stop being responsible”…but instead those words rang out in my heart and shook me awake to the notion that I am not nor can I ever take the place of God in my life. I do have responsibilities and to quote Robert Frost “promises to keep”, yet I cannot control the outcome of this life and that of others around me. I can be diligent and faithful as a Christ-follower, but there will be times where, though I can’t see the future I must willingly step forward and trust my Christ that He truly knows the way. This is extremely frightening to me…not to maintain that control on my life, but I’m positive that I am not the only one. We all take life too seriously in the ways we conduct ourselves and in how we try to control all of the possible outcomes in this life. We try to micromanage this faith and we ignorantly try to tell God how things ought to be and in so doing we fail horribly in our attempts to play God. What have you been trying to control in your life that ought to be placed under God’s authority? We need to stop taking control and being so serious that we fail to allow God to lead! Stop and allow Him to lead even though it might uncomfortable to let go…we will be better for it in the long and Eternal road. Previous Post Previous post:Meditation: Appointing.